Chris Cohen was given his first drum set at the age of 3. Pictures in the family album also show a plastic mic taped to a floor lamp and connected to nothing? This is when he began in earnest what he is still working on today in The Curtains. Inspired at a young age to form a band, Chris acquired the necessary instruments even though there was no one else around to play with him. It was a lonely time but Chris could pretend, and the discovery of “overdubbing” on a 4-track at the age of 12 gave Chris the impression that he could, by himself, synthesize any band he wanted. Chris later met Trevor Shimizu in the year 2000 and formed what is now called The Curtains. They played very short songs, like quiet little lists of musical ideas. At this point they were joined by drummer Jamie Peterson and The Curtains recorded their first record, FAST TALKS for the Thin Wrist label. The thought of vocals never occurred to them, as Chris inexplicably saw The Curtains as some sort of a cross-over ‘jazz’ (?) chamber group that just didn’t improvise. Never content to repeat a formula, the next phase of The Curtains found Chris joined by drummer Andrew Maxwell and synthesizer player Greg Saunier in 2002. At this time, Chris also became a member of the band Deerhoof. Playing with Andrew and Greg, The Curtains’ songs now focused on group interaction and the idiosyncratic playing styles of the three members. This period is documented on 2003’s FLYBYS, also on the Thin Wrist label. But a penchant for tender melodies always lingered and the next album, VEHICLES OF TRAVEL (Frenetic Records 2004), presented all 3 Curtains singing a strange new kind of hybrid song that could have almost been called ‘pop.’ A series of whimsical episodic stories were woven together, connecting the music which had as many different moods and styles as there were tracks. After finishing this record, it seemed that the Curtains had done all that the three could do together. This formation of the Curtains disbanded, and Chris and Greg focused on Deerhoof. But even within the fulfilling and creative atmosphere of Deerhoof, Chris still found himself dreaming about The Curtains, and what it would be like to record alone again, if only there were no deadlines or compromises. So Chris once again fashioned himself the sole dictator of the Curtains imaginary world and recorded CALAMITY. Eventually adding several guests performers to the record – Nedelle Torrisi and Yasi Perera on harmonies, and Half-Handed Cloud/Illinoise-maker John Ringhofer on trombone – this record is only the blue-print for what the songs will be live on stage. With a new 3 pc. 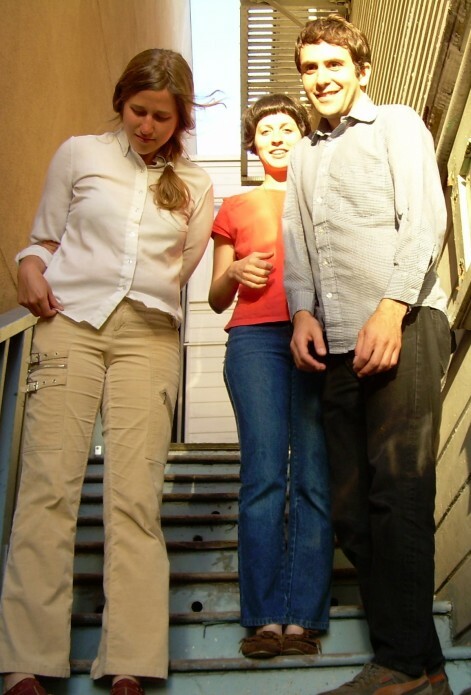 line-up featuring Nedelle (gtr/vox), and Annie Lewandowski (kbds/vox), The Curtains will tour the US in January 2007.